Weighty Matters: The "how" of obesity - laziness vs. complexity? Last week I enjoyed debating Dr. Bob Ross on the relative merits of food vs. fitness, as they pertain to obesity treatment and prevention. Ultimately we concluded, that of course both are important, though we disagreed on whether or not it has been primarily a decline in levels of physical activity, or an increase in caloric intake that has led us to this point. Some might think that doesn't matter. 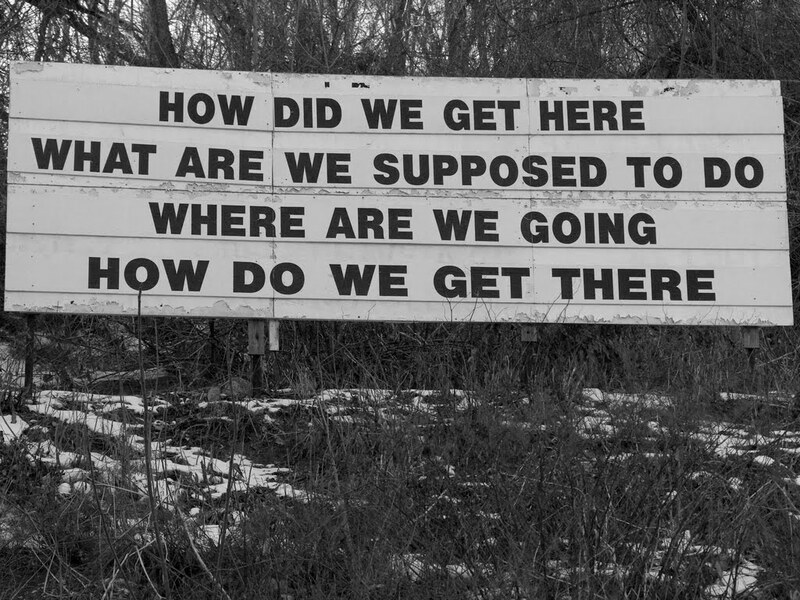 That "how" we got here isn't important. "How" is crucial because it's the "how" we got here that helps us to understand why effective treatment and prevention is so elusive, and also will hopefully help to inform future innovation and policy. While Bob and I disagree on the fundamental caloric basis of the "how", we certainly agree that the "how" isn't by means of personal choice. What do I mean by personal choice? 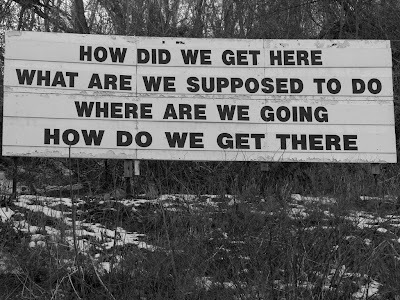 Well, one camp of "how" is the camp that posits that we got here through the individualized personal choices of gluttony, sloth and laziness. That camp was actually well represented during the concomitant debate that was taking place on Twitter, while Bob and I were duking it out on stage. 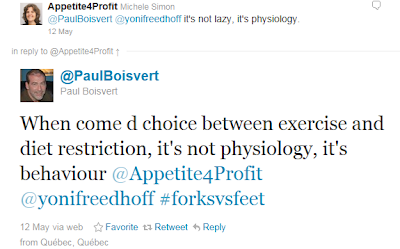 Readers of my blog's comments will certainly know Paul Boisvert, but for those of you who don't, Paul is the coordinator of the Obesity Research Chair at Quebec's Laval University. Seemingly, according to Paul, the "how", is that obesity is the personal choice of people too lazy to exercise. Bob and I would disagree. 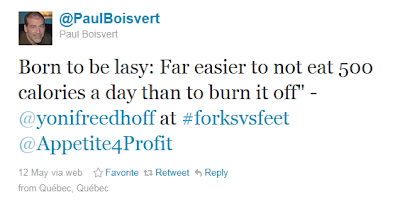 While we were standing on opposite sides of forks vs. feet, we did share a common ground in that we feel it's changes to society as a whole that explain "how", not individually laid blame. Bob explained how the world has changed in that life nowadays requires less "feet". We do far less physical activity, not because we're lazy, but because the world is now doing it for us. Labour saving jobs and devices have supplanted the need for physical labour, and our kids, when faced with a myriad of heretofore unknown, incredibly entertaining, sedentary alternatives to playing outside, often and not surprisingly, choose from their menu of heretofore unknown, incredibly entertaining, sedentary alternatives. I explained how the world has changed, in that life nowadays goes out of its way to push energy intake. Virtually each and every one of us inadvertently consumes more calories than we used to, thanks to such things as our faster pace of life, federal farm subsidies that drive the increased availability of low-cost calories, an exponential rise in food advertising (especially the advertising targeting children), increased reliance on meals purchased outside of the home, scientifically engineered hyper-palatability, the health-halos of front-of-package health claims, mindless eating cues, growing portion sizes and the incredible failing of public health officials to provide useful, evidence-based guidance on nutrition and energy balance. Couple those issues with what we're learning about things like genetics, epigenetics, obesogens, fMRI food addiction studies, weight contributing medical co-morbidities, drug-induced weight gain, and the failing of our medical education system to educate physicians about how to deal with obesity, and the "how" reveals itself to be a highly complex, multi-factorial, amalgam of cause. It is this complexity that precludes simplified to the point of useless, "eat less, move more" messaging, and certainly it also reveals the error and bias in an individualized, blame based attribution to obesity's causes and solutions.